Pub in West Ealing, in the Good Beer Guide. 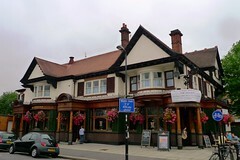 It's part of a small chain that also includes the King's Arms in Ealing and possibly the Raven in Hamersmith. This large corner pub has a number of distinct areas inside, though all are connected internally with no doors. Wood panelling and exposed floorboords are used throughout, and the windows feature stained glass. To the right is what clearly used to be the public bar, which now has a large flatscreen and a mix of high tables and chairs and normal ones. This leads through onto the side fronting Leighton Road, which is more spacious and has banquette seating as well as normal chairs and tables (and another flatscreen). Fairy lights decorate the ceiling here. Further on is a carvery area which also has some seating, and finally there's a garden including some covered seating. Kake, Ewan, and other Tube Walkers visited on a Sunday afternoon in September 2012. There were five real ales on: Robinson's GB ("Frederic's Great British Golden Beer"; £3.55/pint), ESB, London Pride, Titanic Iceberg, and Gale's Seafarers. There were quite a few people in, many of them with children, and many of them enjoying the Sunday carvery photo of menu in Sep 2012. The flatscreens were showing sport with the sound on; more loudly in the public bar side, but audible throughout the pub. According to the 2013 Good Beer Guide, Thai food is served Monday-Saturday and there's a carvery on Sundays; also, Wednesday is quiz night and there are poker tournaments on Thursdays. Accessibility: A small step at each entrance (less than kerb height). It's step-free to the bar, all seating areas, toilets, and garden once you're in. Last visited by Kake, Ewan, and other Tube Walkers, September 2012. Opening hours taken from the 2013 Good Beer Guide. Last edited 2019-01-03 11:16:02 (version 11; diff). List all versions. Page last edited 2019-01-03 11:16:02 (version 11).